Carnacon's quest for a second successive All-Ireland Ladies Senior Club Football title was ended by Galway's Kilkerrin-Clonberne in Saturday's Connacht decider. 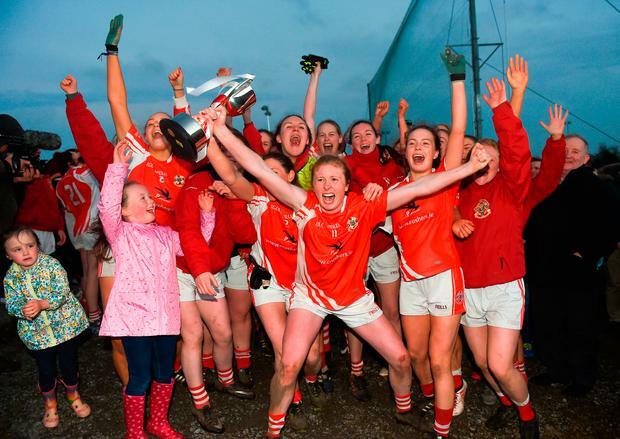 Goals proved crucial as Kilkerrin-Clonberne claimed a first provincial senior crown since 2015, with Ailish Morrissey, skipper Louise Ward and Annette Clarke all raising green flags in Ballyhaunis. This 3-4 to 1-8 victory was sweet revenge for Kilkerrin-Clonberne, who lost out to Carnacon in a replayed Connacht final last year. Cora Staunton's 1-7 wasn't enough for Carnacon. Kilkerrin-Clonberne's reward is an All-Ireland semi-final clash with Mourneabbey. On the opposite side of the draw, it will be Dublin's Foxrock-Cabinteely against Monaghan's Donaghmoyne. Fox-Cab made it four successive Leinster senior titles yesterday with a 4-11 to 1-8 victory over Laois outfit, Sarsfields, in Kinnegad. Skipper Amy Ring led by example with a 2-4 haul, with Róisín McGovern coming off the bench to collect 2-1. Clare Conlon scored 1-6 for Sarsfields. On Saturday, Donaghmoyne claimed a 1-15 to 1-8 victory over Donegal's Glenfin in the Ulster final. Cathriona McConnell collected 0-9 for the winners in Killyclogher, with Eimear Traynor's goal also important. Donegal county stars Yvonne Bonner and Karen Guthrie combined for 1-7 (Bonner with 1-4), but Donaghmoyne had too much big-game know-how. Elsewhere, in Saturday's Connacht junior decider, Sligo's Tourlestrane claimed victory over Galway's Naomh Anna Leitir Móir. Yesterday, Galway added the intermediate crown when St Brendan's overcame Mayo outfit, Westport. Dublin's Clontarf were crowned Leinster intermediate champions, but in the junior decider, Castleknock, from the capital, and Carlow's Old Leighlin will have to do it all over again following a classic drawn final. Trillick, from Tyrone, and Monaghan's Emmet óg are the Ulster junior and intermediate champions respectively. There were also quarter-finals in the All-Ireland junior and intermediate championships on Saturday. Cork's Glanmire will meet Trillick in the All-Ireland junior semi-final after defeating Roger Casements (Coventry) in Birmingham. And Edinburgh's Dunedin Connolly's will take on Monaghan's Emmet óg in the All-Ireland intermediate semi-final after accounting for Kerry's visiting Na Gaeil on home soil.